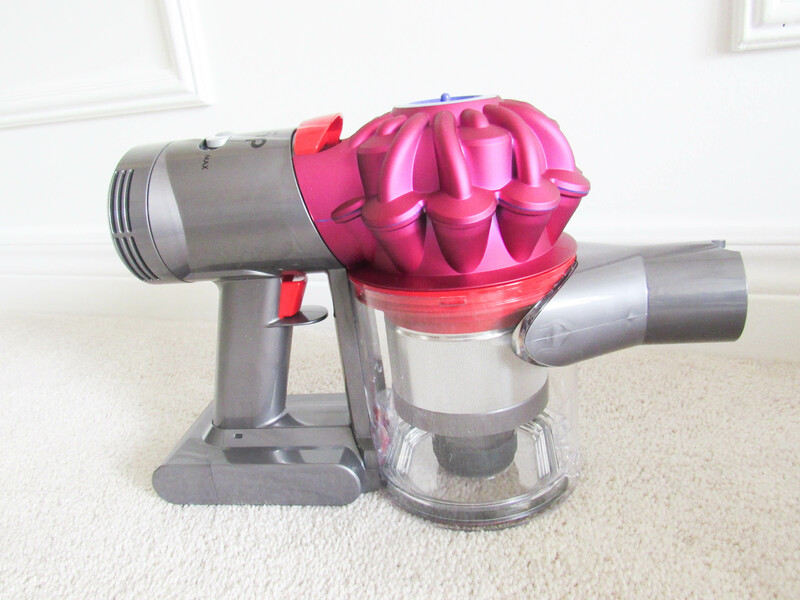 Easy Clean Up with the Dyson V7! When we bought our home 10 years ago from a builder, the most exciting part for me was when we got to pick our finishes. I wanted everything to look light, and clean, so I went with a lot of white and cream finishes throughout the house. I chose white kitchen cabinets, cream tiles in the kitchen and bathrooms, and WHITE carpets. I know, what was I thinking? I wasn’t thinking about kids down the road that’s for sure. I was just thinking of my husband and I living here, and that we are very neat and clean, so it would be fine. Now having 2 kids, we quickly realized the colour white, and children don’t work well together. I am now constantly cleaning finger prints off the kitchen cabinets, and crumbs off the tile and carpets. So time consuming! Lugging my old heavy vacuum around wasn’t helping either. I would be sweaty after just vacuuming 1 room, and the worst was seeing it didn’t even pick everything up. I would then have to go back, and vacuum the room again. 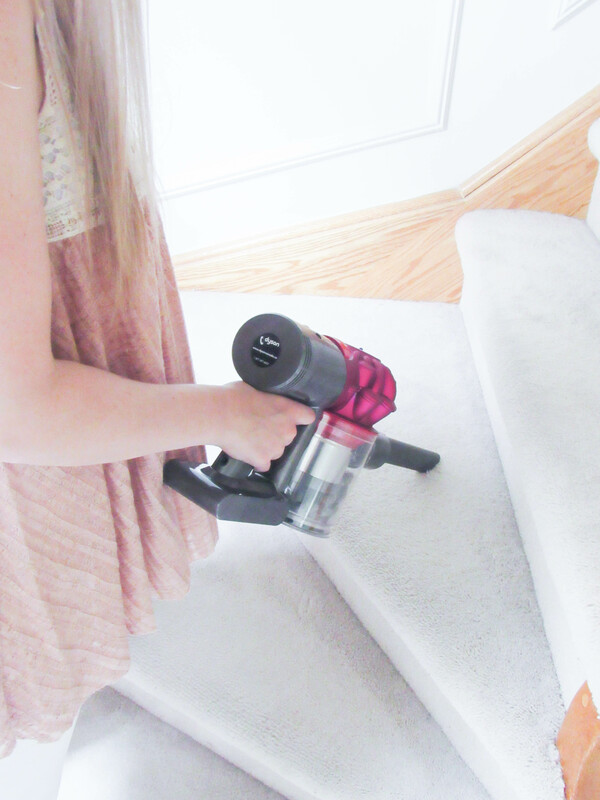 Which was so annoying, because it was taking me twice as long to vacuum the whole house. 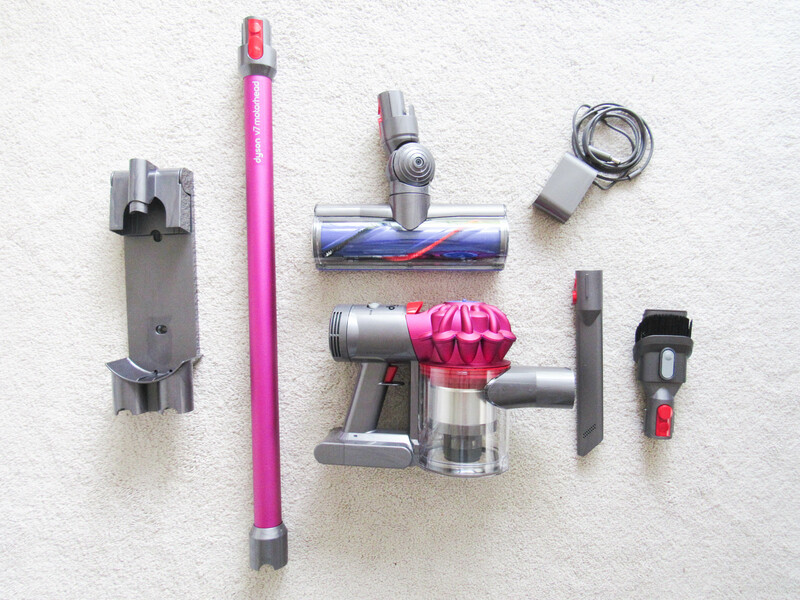 When the Dyson V7 arrived at my door, I couldn’t have been more excited. I couldn’t wait to try it out, and see if I could cut my cleaning time in half! The assembly was so quick and easy! 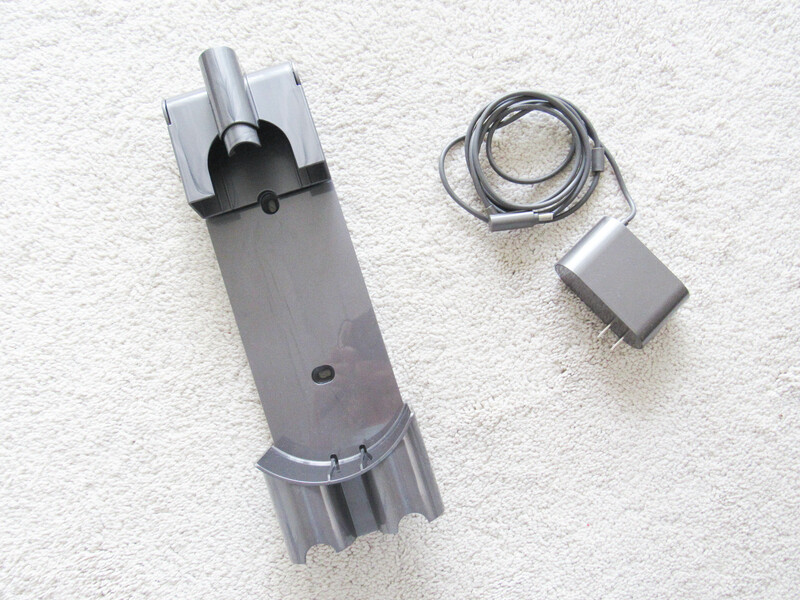 All I had to do, was click the motor-head to the pole on one side, and the cleaner head to the other side. It was just 2 clicks, and I was done! 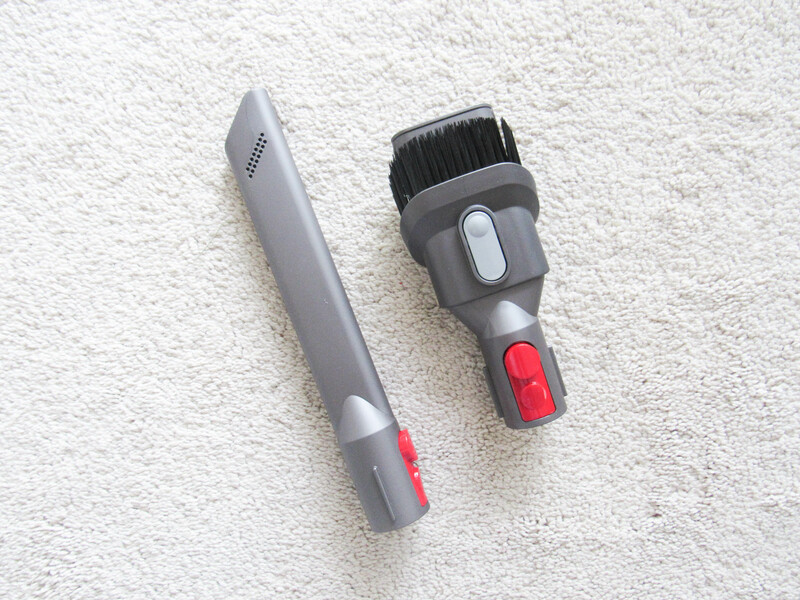 It transforms into a handheld as well, which works great on my stairs, in the car, or for just a quick clean up. It comes with 2 attachments for those hard to reach spots, like between the couch and the wall. 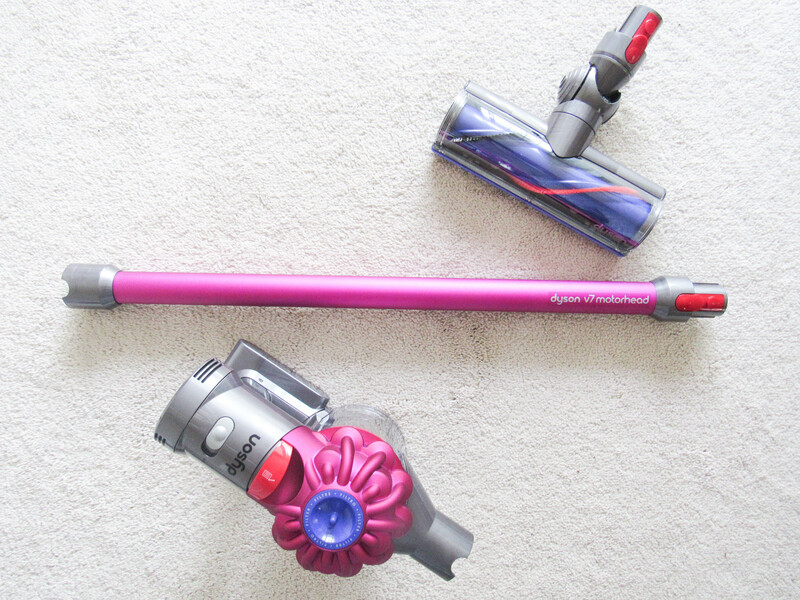 What I loved most about the Dyson V7 is that it’s CORDLESS!! 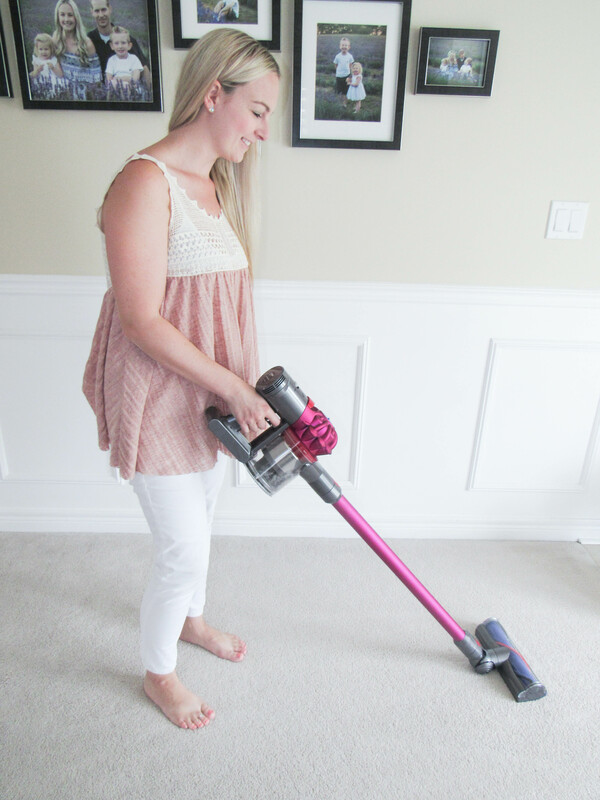 All those years vacuuming with a cord that always got in my way, to finally getting a cord-free vacuum was such a nice feeling. They Dyson V7 comes with a docking station, so you can store, charge and keep the additional attachments all in one place. 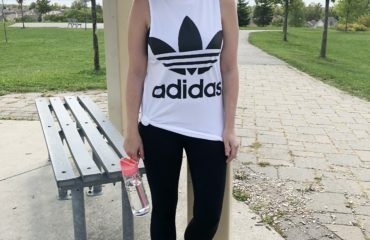 You just charge the V7 for 3.5 hours, and it gives you 30 mins of run time. Once you’re finished vacuuming, you just place it back on the docking station to charge again, so it’s ready to go when you need it next! 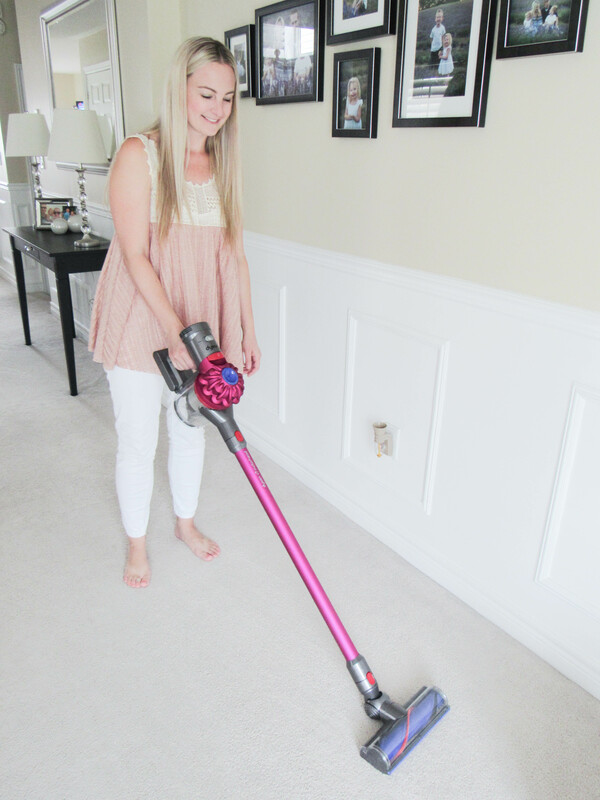 The cleaner head goes from carpet to tile with a breeze which is great, because I have a mix of tile and carpet throughout my home. To empty the bin, you just have to press one button. So FAST, simple, and easy to do. This vacuum is so light weight. I am not sweating vacuuming anymore I can tell you that. It’s so easy to transport from upstairs to downstairs as well. It’s slim and compact, so it’s easy to store. I have mine in the laundry room on the main floor, which is so much more convenient and easier to get to. My old vacuum I had to keep it in the basement, because it was so big. It was so annoying to have to lug it up the stairs every time I needed to use it. Most importantly, it’s POWERFUL! It gets the job done in 1/2 the time my old vacuum did. Which is saving me a ton of time! 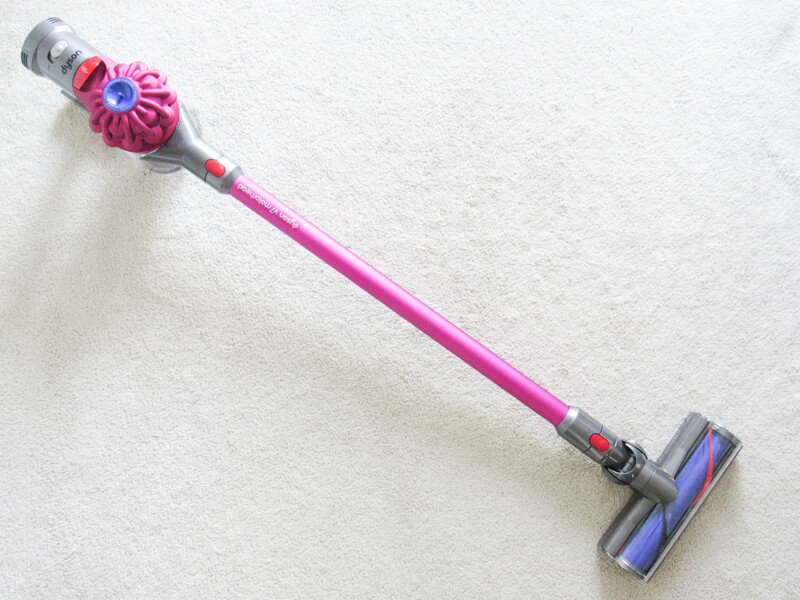 Clearly my old vacuum wasn’t working properly, because the Dyson V7 is doing a way better job. 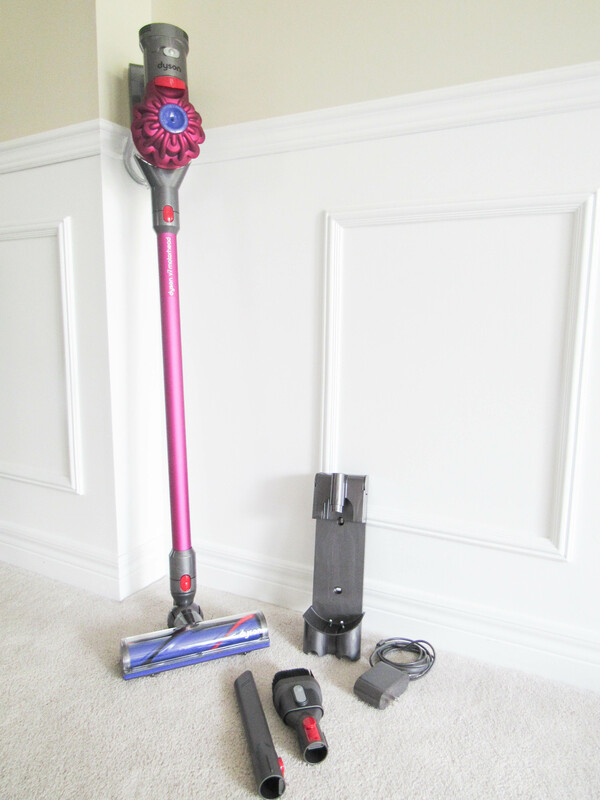 I always wanted a Dyson, and now I am so happy I finally got one! 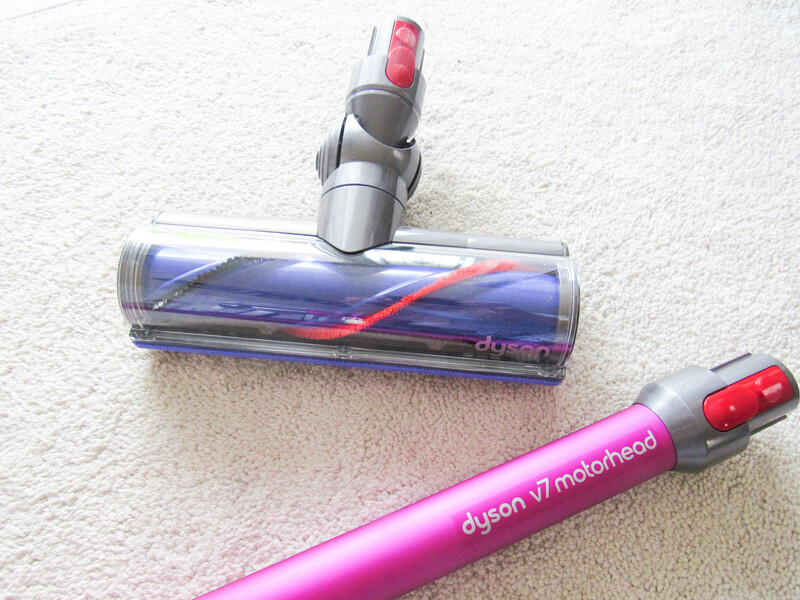 For more information on the Dyson V7, head over to their website, here. 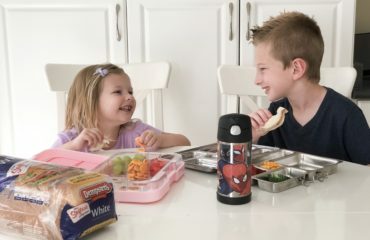 Disclaimer: I received this product in exchange for this review. 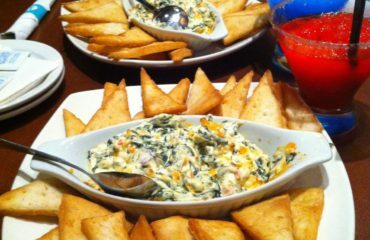 However, all thoughts and opinions are 100% my own.